“Seasonal modern.” “Farm-inspired food.” And the most dreaded, “New American cuisine.” But here’s a secret truth: Nobody really knows what these terms mean. They use them anyway, because they sound like something people will gladly wash down with a $14 glass of wine. Lark on the Park falls, more or less, into that trap. “Contemporary urban with global influences” is how it describes its style on the website, but that’s just another meaningless term masking a flibbertigibbet of styles. Whereas other restaurants have successfully turned the idea of farm-to-fire ingredients into unique and interesting dishes with a fresh flourish — chef-driven, buzzy places like FT33 or Oak — Lark feels like an orphan in search of its parental figure, craving acceptance but not knowing what it wants. Deciphering what chefs Melody Bishop and Dennis Kelley are trying to accomplish with this room is like reading hieroglyphs in a dark chamber of a musty pyramid. Assigning Lark a catchall “global cuisine” sobriquet doesn’t sufficiently explain anything — not the decor, not the ambiance, not the food. Let’s start with its look, which is pleasant but unimpressive. The entrance takes you past a beer wall that suggests a gastropub (another squishy generic that’s been woefully overused). The placement subtlety suggests the food is secondary to the beverage program, but that hasn’t been my experience. The bar area opens up into a large, nondescript dining room where tables are bivouacked into neatly aligned rows that suggest a military mess hall more than a fine-dining option near Klyde Warren Park. 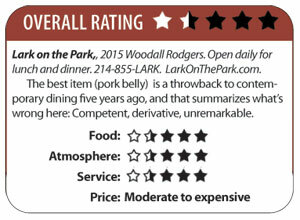 (Including in its name “on the park” is a generous extravagance — it’s located on the ground level of the north side of the Woodall Rodgers access road and views of the grassy deck are fleeting, especially if you’re seated in one of the inward-facing seats.) The walls are covered in blackboards on which are sketched both menu items and original art — all of it in grade-school white chalk, as if color might distract us from the food. And that’s simply not going to happen. Lark reflects the Balthazar-ization of bistro dining: Throw some French words like steak frites and salad Nicoise, add an onion tart and maybe a soufflé or cheese board to the dessert list, take a puckish approach to décor and boom! Declare yourself Café Nouvelle Americain en Provence. But it doesn’t feel authentic, and there’s no sense of follow-through. Everything seems arrested mid-concept. Of course, cheesy marketing and banal interiors don’t automatically equate to a lack of competence in the kitchen, but they are symptomatic of a muddled point of view which is evident in the dishes. That Lark Nicoise salad ($17), for example — with its grilled rare tuna and flavorful tapenade — is certainly a more-than-adequate iteration of a familiar, protein-rich entrée salad. But it never approaches the level of “signature dish” that would get me coming back, and when you have a fairly limited menu like Lark does, not at least trying to make every dish a highlight manifests a lack of personality, not to say of vision. The steak frites ($18) was another unambitious misfire. 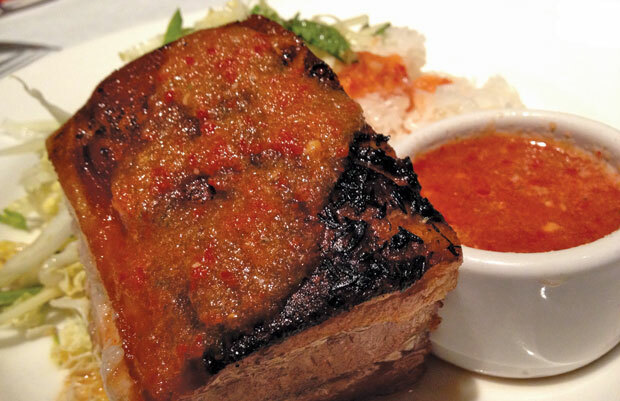 Order a steak, and you expect beef to be the centerpiece of the plate; not so here. Dominating my dish was the modern equivalent of that ’70s-era omnipresent parsley: the mesclun salad. Tossed with a pedestrian vinaigrette, this messy pile of greenery in no way incorporates itself into the entrée, crowding out the meat and encroaches on the criminally over-salted French fries like kudzu over Georgia farmlands. If the idea was to give the plate a blast of color, the steak itself already had some from the chimichurri — a blast of color yes, though not a blast of taste. 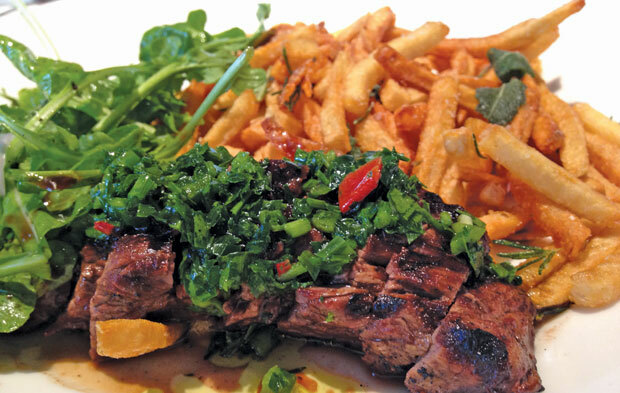 The chimichurri was a pallid, under-developed sauce that couldn’t hide much about this surprisingly tough preparation. On another visit, my dining companion ordered the hanger steak, also known as “the butcher’s cut” for its combination of tender muscle and light marbling, but even though he ordered it medium, it came out medium rare; the seasoning was spot-on, however. But at $29, it should arrive to the table as ordered. Another dining companion enjoyed, but refused to rave over, the diver scallops ($29). Lunch and dinner menus are quite different, though they have cognates. Both offer antipasti boards ($13), where the burrata is always the star. At lunch, the queso fundito ($10) is addictive, as all queso fundito should be. The moo krob ($24) may have been the best item I’ve tried at Lark. Yes, pork belly — even luscious cuts brushed with a spice-sweet glaze — have passed their trendy-dining shelf-life, but this thick, fatty and perfectly seasoned slab retained its juicy flavor and was an ideal autumn-eve cockle-warmer. A side of coleslaw, though slightly spicier (think kimchi-lite), didn’t meld as well as did the sticky rice. Service doesn’t stand out at Lark, either. While everyone on staff was pleasant, at one visit it seemed like five different people were waiting on us, and no one ever introduced themselves as our server. Maybe that’s not part of the ethos with New American cuisine. Or a park-adjacent Euro-kitchen. Or contempo-global food. Who knows? Nobody, that’s for sure. This article appeared in the Dallas Voice print edition December 6, 2013.